Traditionally Pullihora (or yellow rice) is made with rice, the yellow color stemming from the fragrant turmeric powder that is used in abundance to give the rice the distinctive yellow color. The three key ingredients are the rice, turmeric and either citrus juice from a lemon or tamarind juice to give it a tangy flavor. Seasonings tend to vary by personal preference. Variations of this dish can be made by substituting the lemon or tamarind juice with Indian grapefruit juice, mango juice, pulp or shredded mango, or any citrus fruit juice that is not sweet. 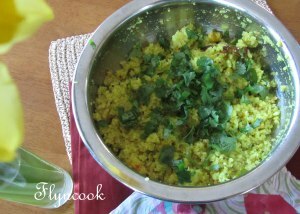 Rice can be substituted with poha (flattened rice) or rice rava etc. Here is a healthy variation using Quinoa.